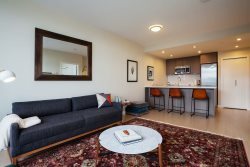 Welcome to 1090 Johnson, a luxurious suite right in the heart of downtown Victoria. Although this suite comes with secured underground parking, you can happily walk around on foot to find all the restaurants, shops and attractions you desire. There is a lot to see and do and around this condo's location! The minimalist and relaxing environment will be sure to enrich your stay in Victoria.